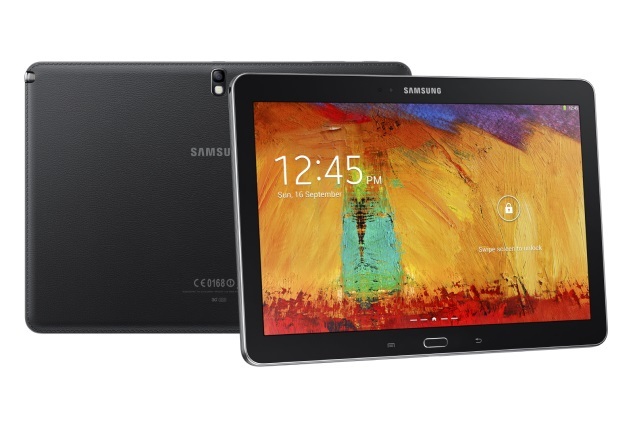 Buy New Samsung Galaxy Tab Note 10.1" LTE 32GB p6050 Tablet (Black) Malaysia At FotoZZoom! The 2014 edition of the Galaxy Note 10.1 includes both LTE-A and a 2560x1600 pixel LCD display. The industry’s first LTE-A model of Samsung’s new flagship tablet PC is being unveiled today in South Korea. Samsung Electronics announced on October 31 that it will introduce the LTE-A Samsung Galaxy Note 10.1 2014 Edition through three local mobile carriers on November 1. A Wi-Fi model will be launched as well. The factory price is 946,000 won for the LTE-A model and 799,000 won for the Wi-Fi version. The new tablet PC only comes in classic white or jet black. In comparison, the LTE version, which was introduced last year, cost 891,000 won, and the old Wi-Fi model was sold at 748,000 won per unit. The new Galaxy Note 10.1 features a 10.1 inch 2560x1600 pixel LCD display. With a quadrupled pixel density, it offers much better image quality than previous versions of the tablet. The LTE-A version has a quad-core 2.3GHz Qualcomm Snapdragon 800 processor, 3GB RAM, and a 8220mAh battery, and uses the Android 4.3 operating system. On the other hand, the new Wi-Fi model is equipped with a 1.9GHz Exynos 5 Octa processor. Samsung’s latest model comes with an improved S Pen featuring Air Command and other functions already available in the Galaxy Note 3. The Galaxy Note 10.1 2014 Edition is this year’s first tablet PC introduced through local mobile carriers in Korea. Previously, Samsung’s Galaxy Note 10.1 and Apple’s iPad Mini were revealed on November 2012. With Samsung releasing its latest tablet PC, intense competition between the Korean company and its rival Apple seems to be inevitable, since the iPad Air is due to be revealed at the end of this year. GALAXY Note 10.1 offers you enough screen space to do multiple tasks simultaneously. You can activate two Apps, such as movie player, S Note at the same time. And you can draw or scribble while you are doing something else, like watching movie.